For years we’ve known about the importance of using recycled papers and the environmental hazards of the printing process. And for years, some have made excellent progress in the field, while many are still unaware of the benefits of printing cleaner and greener. While talking with our favorite printer, we asked where the industry was in relation to being more responsible to Mother Earth. From these chats, the Hopper Press Project was born. 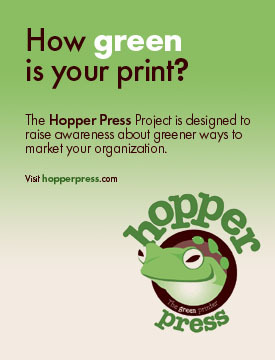 Hopper Press was created to shine a light on better ways to print. We think we can make a profound impact in how we print, by targeting the three audiences who most influence what gets printed: clients, designers and print shops. Some corporate clients are sensitive and aware of environmental concerns and care more about their image. By focusing on designers, we can directly connect with the creative source–and better create pieces that make most effective use of the medium. And printers can majorly influence projects by following cleaner procedures in their shop. Even changing their “house stock”, the main papers they provide as a standard, to post-consumer recycled content can have profound impact industry-wide. The printing industry flies under the radar, when you think about big business. Where do you think they rank? The amount of print produced each year is staggering. Sheer volume demands we do all we can to make the most efficient use of materials. Cleaner printing, even simplest techniques, relates to a big difference. The printing industry is incredibly diverse, and made up of mostly small businesses. This means that best practices and their implementation are almost impossible to gauge. Some say that only when customers demand cleaner, greener materials and a more eco-sensitive mind set, will we see change, but the opposite is true. Printers themselves and the suppliers and manufacturers that serve them see the need to better manage the process and products. Consumers still matter, and every little purchase makes a difference. On a recent trip to a large office supply chain I was happy to find a decent paper stock at reasonable price. Often a recycled paper symbol doesn’t mean what we think it does, but in this case, 30% post-consumer waste content is a welcome sign. Progess is being made on every front, but we as consumers can speed things along by choosing better products. Help by looking at all the materials your organization prints, and better manage the process, from the volume to the materials you use. A revolution is underway–and you can be a part of it. Visit p2pays.org for the entire report on the printing industry and pollution prevention material. * Source: North Carolina Division of Pollution Prevention and Environmental Assistance (DPPEA).